As the weather starts to change, so does your skins needs. Especially as the weather turns colder. I've already noticed a huge change in my skin and it's not even been that cold yet. I've been making a few changes in my skincare and I thought I'd share a few tweaks you can make to ensure your skin is looking it's best. This is probably the most important tip. Is your skin feeling a little more dry, breaking out more? or more sensitive? Once you know what your skin needs it will be easier to know what products to use or avoid. Personally, my skin has been so dry, more so than usual! 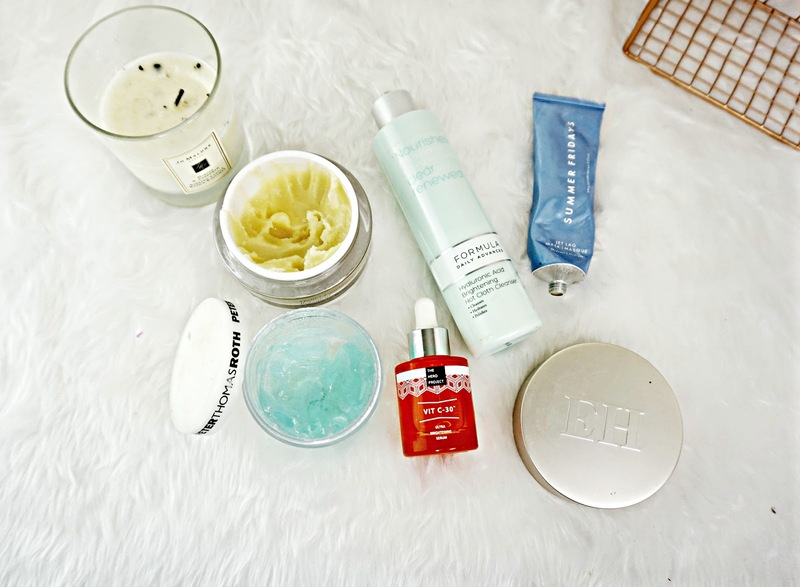 Throughout summer I've been using gels and lighter cleansers. But as the weather cools down it is likely that your skin will be producing less oils. I know mine has. So switching to a balm or an oil will effectively cleanse the skin without stripping it of its natural oils. Although in the morning I do like something more light so I'd switch to a cream. For a PM cleanse I really recommend the Emma Hardie Moringa Cleansing Balm* | £47 | it has a rich nourishing texture that emulsifies really well when mixed water. It removes all makeup and deeply cleanses without stripping the skin at all. For an AM Cleanser I really rate the Formula Hot Cloth cleanser* | £6.50 | although this is a rich cream cleanser I still really enjoy it in the morning. It doesn't leave a film or anything on my skin. It does an excellent job at cleansing my skin without stripping it. Oils containing Vitamin C are a great way to hydrate and tackle dullness. This oil in particular is so good. First of all it smells amazing! It has quite a rich texture but it absorbs into the skin quickly. It really helps to hydrate my skin. I feel like this has really helped to make my skin look bright and radiant to. This mask is brilliant. It has a rich texture that cocoons the skin and powerful ingredients that deeply hydrate. You don't have to actually rinse this off. It really plumps my skin leaving it supple and smooth. Not only that but gives the skin a gorgeous radiance to it. If you have dry skin definitely check this out. Another hydrating mask that transforms my skin is this one from Peter Thomas Roth. It uses a cocktail of hydrating ingredients that intensely nourish and hydrate the skin. It's gel like consistency instantly feels cooling on the skin. I like to leave this on for around 20 minutes and after removing my skin feels so smooth. My dry areas are hydrated and my skin looks all round better. What products do you add to your routine in the autumn?